In a nutshell, without going into a frenzy of physics and chemistry, liquid gases like propane or butane contain a number of oily “evaporation” residues. These get into the liquid gas during the manufacture and distribution and can get trapped in the gas flow during use and clog up the valves and gas pressure regulator – which will cause a loss of gas pressure or even a failure of the gas regulator (as the diaphragm fails). That doesn’t sound like too big a deal, but imagine the scene: It’s 8pm at night, cold and wet, you’re not hooked up to mains electrics and her indoors is fretting about having a cold shower in the morning when the gas stops working. 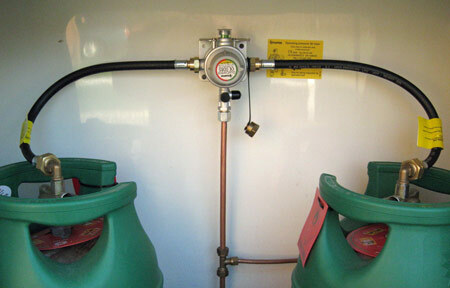 You haven’t got a spare regulator tucked away in your locker (who has) so what do you do? Could this scenario be avoided? Yes it can, by fitting a gas filter which uses a replaceable filter cartridge in a metal housing that removes 99% of the oily residues before they clog up the pressure regulator. Usefully, there is a built-in “saturation” indicator which indicates when it needs replacing. The filter comes complete with a dedicated multi-tool which unscrews the cartridge housing and is used to install or remove the filter from the system. You need one filter for one regulator or if you have an auto-changeover system, you need two filters. (As pictured in the finished setup below). 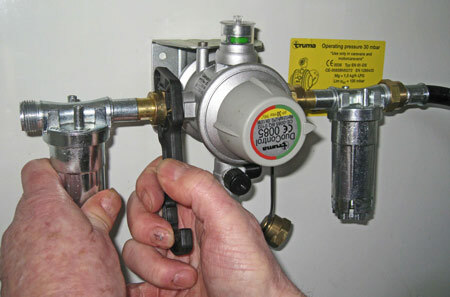 This simple procedure can be done by your dealer, perhaps when you have your unit serviced, he’ll do a gas test upon completion too, or it can be done as a DIY project; you can do this is about 15 minutes, but you should then have it gas tested by a person qualified to do so, preferably at a dealer. TOP TIP. Do not smoke or use a naked flame when installing this gas filter. 4) Connect the filter to the regulator, mating the female connector to the male connector. 5) Connect the gas tail(s) to the filter. 6) Connect back to cylinder and turn on the gas. The filter will need changing from time to time, depending upon your gas usage. This is a simple and quick procedure too; just unscrew the filter housing, wipe out any residue with kitchen roll, then unscrew the cartridge using the glove provided. Pull the glove off your hand using it to envelope the used cartridge. Install the new cartridge and tighten it by hand only, then screw the outer housing into place. Dispose of the glove and its contents in accordance with your local authorities’ environmental regulations. I recently encountered this problem with my new 2016 March Fiat Trigano tribute… The gas regulator fitted is a Trumar mono control CS with the anti collision device fitted … I’ve booked up on Boxing Day for a five day tour of Somerset and within two days I noticed the flame on the burner which only has two burners was getting lower and lower and lower until it stopped working completely I was under the impression that gas bottle was empty so I went to the reception at the caravan site and exchange the bottle that was fitted for a new one.So I fitted the new bottle on and was hoping to be able to have a meal as I was getting extremely hungry and to know avail the same thing happened the burner would light slightly for a few seconds and then just go out dismay! I contacted the campsite reception who were extremely helpful and gave me the card of the gas man who services caravans and motor homes and was local he came round the next day looked at the problem and diagnosed it straight away ..yep!.. It’s your gas regulator it’s blocked up with oil from the gas bottle..it gums up the diaphragm and no Gas can get through…simplest solution take your regulator off and fit the old style regulator there more robust more reliable and the only reason your van is fitted with the Trumar Mono control CS is because by EU law you have to have it fitted if you travel in Europe and have your gas heater going while your vehicle is moving! He fitted the old style regulator done a complete gas check and everything was fine…thanks campertec. Thanks for sharing this Martin and glad you managed to get back to cooking on gas! I am a gas man and I think this article is excellent. The only comment on the article I would make is that you don’t explain why you should wrap the old filter in the glove. The reason is, that the oil residue stench makes a skunk smell of Dior perfume in comparison. You cannot get it off your clothes, you have to throw them away if you get this oil on them. If you get it on your hands, your wife most certainly will not want you to scrub her back, you will be lucky if she allows you in the same county. It will take three weeks to wash off. The oil is most likely to settle at the bottom of a U bend, if you have any gas pipes that loop down then up. It is true that you get this oil residue in LPG. I once went to a house that ran its central heating off a LPG tank in the garden. The boiler had stopped working because the feed pipe was blocked with this oil. I have heard that Autogas (what you use to refill your on-board tank) is more likely to produce it than for example Calor gas but I am not an expert. As for the fact that caravans have been using Calor gas for 60 years with no bother, I might hazard a guess that either refinery processes may have become less rigorous so letting more oil through, or LPG comes from different parts of the world and what we are using now is more oily, or possibly that old regulators were more robust. Possibly we use caravans and motorhomes more than we did 50 years ago. I don’t recall having showers in caravans then, even in Bessacars and Safaris, we were lucky if we had a foot operated water pump. That was a deluxe extra, I remember. Is it possible to flush the regulator/pipes with a solvent or is this likely to damage it ? Hi Rick, I have spoken to Dave King following your comment and his advice is not to use the solvent as that could cause a number of issues. He recommends fitting the filter as described in the article. Hi Dave, many thanks for getting in touch. I’m not sure there’s a lot we can do to help on this occasion I’m afraid. If the gas regulator failed after one year then it’s likely it won’t be covered under warrenty – presumming the warranty was for 12 months only? If you would like to email me directly on lucie.carter@caravanguard.co.uk I would be more than happy to put you in touch with a representative at Lunar. I purchased a new Lunar caravan in April 2014, a year later on its annual service I am advised I have to pay £137 + 30 minutes labour to fit a new filter and it is not covered by warranty!!! Purchased a new van in 2009 had to replace regulator in 2011( still under warranty) clogged up completely, loss of gas pressure again this weekend had to replace regulator again, replaced pigtail as well as it was out of date by 12 months, been told to get a inline filter from truma this should ” Stop the rot” as it were. Filters got be worth it as regulators cost around £40-45 depending where you have to get one from on a Sunday morning. This system has had it’s problems since it was first introduced. What dos this system do better than the old and well established screw on to the cylinder type ? Maybe cost us more and be more problematic and possibly create a new item ie filters to be purchased, more money to the greedy caravan traders? or am I being cynical ? If it aint broke don’t fix it! Dave King on Gas regulators clogging up. Would I be able to purchase this filter unit from a Calor Depot ? 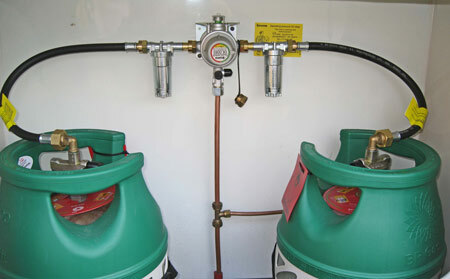 If the design had been properly designed and proved in the first place this procedure would not be necessary… It is poor that a new design is introduced which necessitates the owner to fix extra expensive equipment All of our caravans (1981 on) have and have had the old style regulator on the gas cylinder- yes I do carry a spare regulator (-all moving parts wear out eventually) so far it has not been out of its bag.